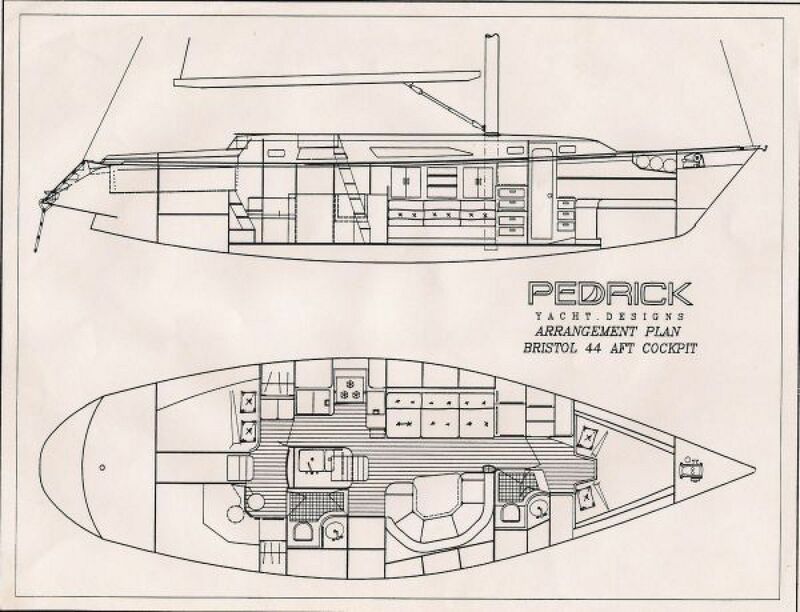 A unique boat that blends the comfort and fine finish of a Bristol with Pedrick designed performance. 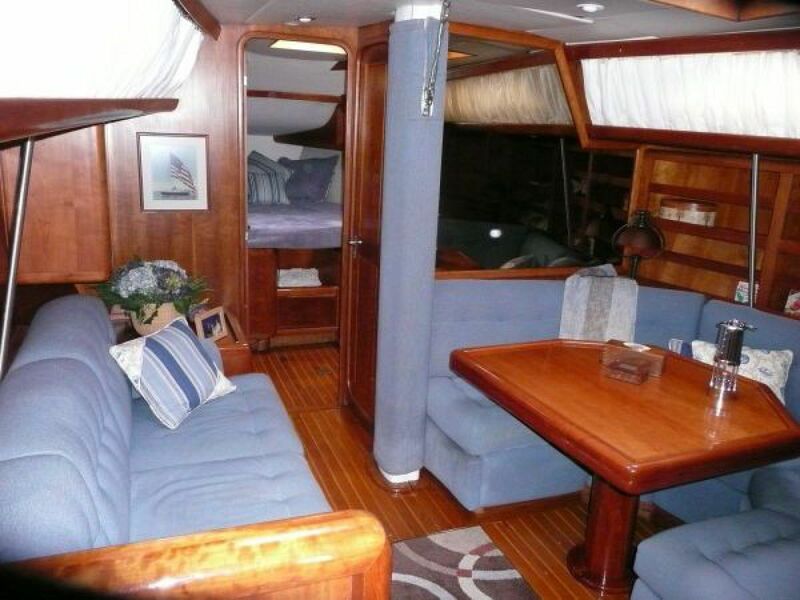 The layout has two staterooms and two heads with two companionways. 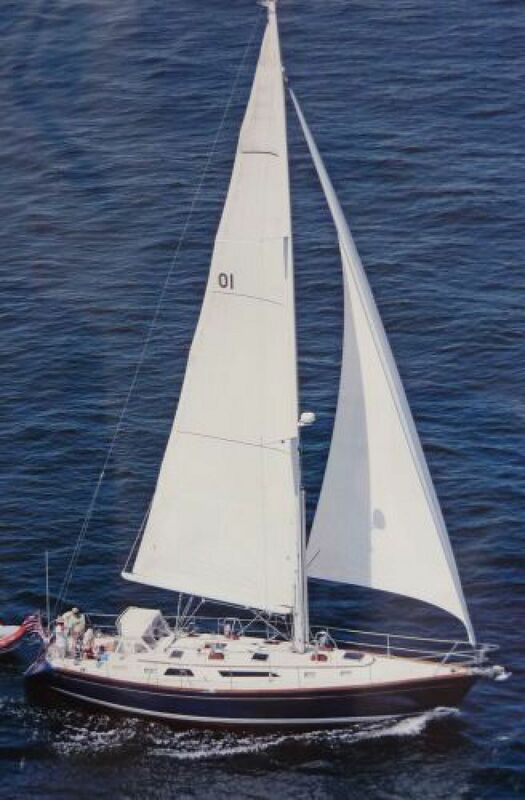 "Faial" has been very successful on the race course and has an enviable record in the annual "FUGAWI". 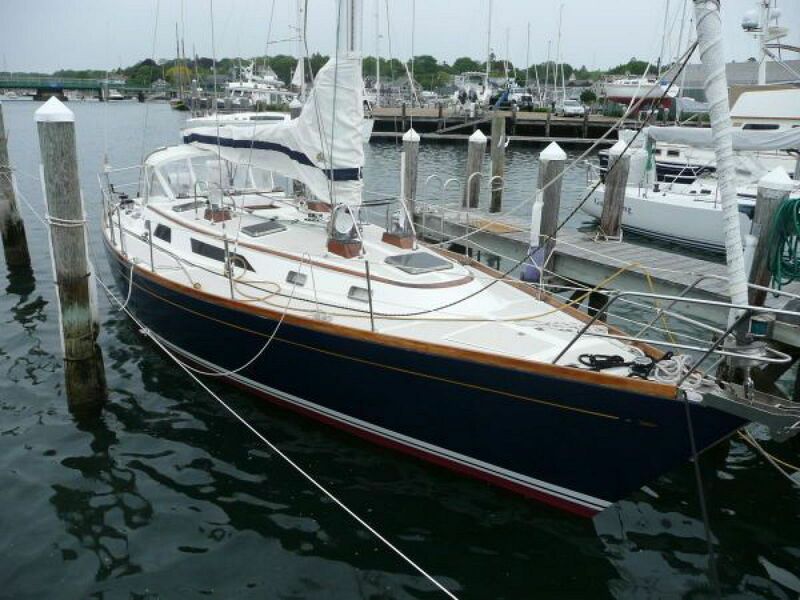 A PHRF rating of 87. Equipped to comfortably cruise or be successful around the buoys. 2017 Winner of the Whaler double handed race. 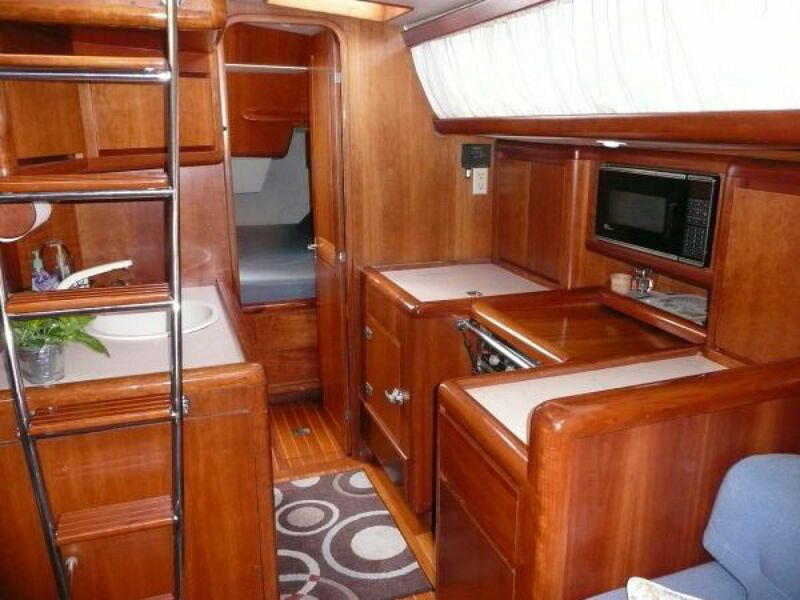 The interior woods are hand matched grain North American cherry, hand rubbed and varnished. The form, fit and finish is that of the highest level. Gentle radius and bull nose edges are some of its details. Modern recessed indirect and direct lighting adds to the interiors warmth. 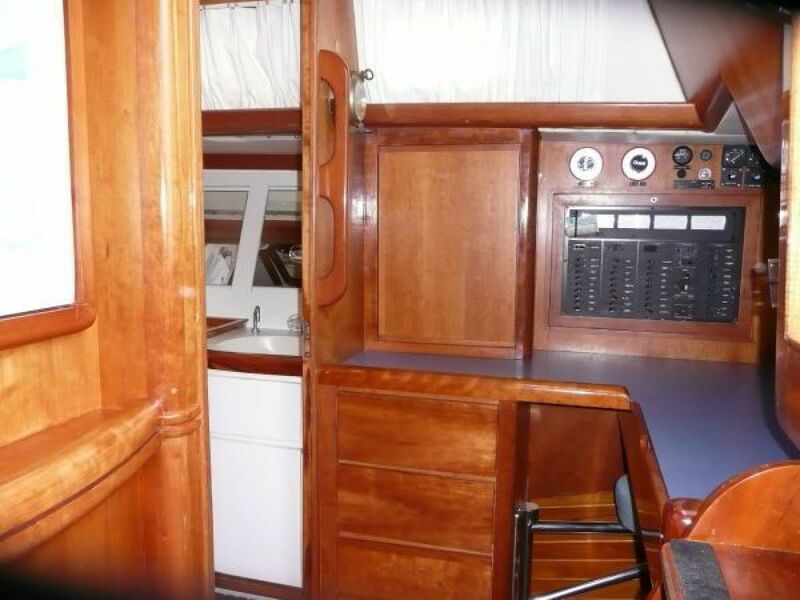 The galley is located on the port side and features ample pantry and counter surface for food prep, inboard sink, LPG 3 burner stove and oven (2014), 12VDC/110VAC refrigerator/freezer cold plate system. Custom dish and glassware lockers and all corian counter tops. Microwave. New hot water heater. Service electrics are 12VDC and 110VAC. 1-90 amp alternator via house battery bank. A 110VAC 40amp battery charger. 1-30' 110 VAC/30amp shore power cord with audible polarity alarm. Batteries: 2-12V-225amp (450 amp hrs.) for house service battery bank (two seasons old). 1-12 V-225 amp engine start battery. Battery banks are connected by a rotary 4 position transfer switch along with a momentary emergency switch to join all battery banks for emergency engine starting. 50amp alternator for engine start battery. Chain plates, seacocks, machinery and tanks are connected to a heavy 4" copper strapping to the earth bond to prevent electrolysis. Custom master switchboard 12VDC and 110VAC. Custom interior lighting with overhead dimmers and rope lighting at floor level. Westerbeke 46hp FWC diesel engine on flexible mounts with a Hurth Twin Disc 2:1 short profile gear box. Engine space is insulated with lead and 1" Mylar faced fiberglass. Excellent three sided access to engine. 1-1/4" S.S. aqua Met shaft with a 3 blade Max Prop. Flag Blue Awlgrip hull. Whale tail lead keel. 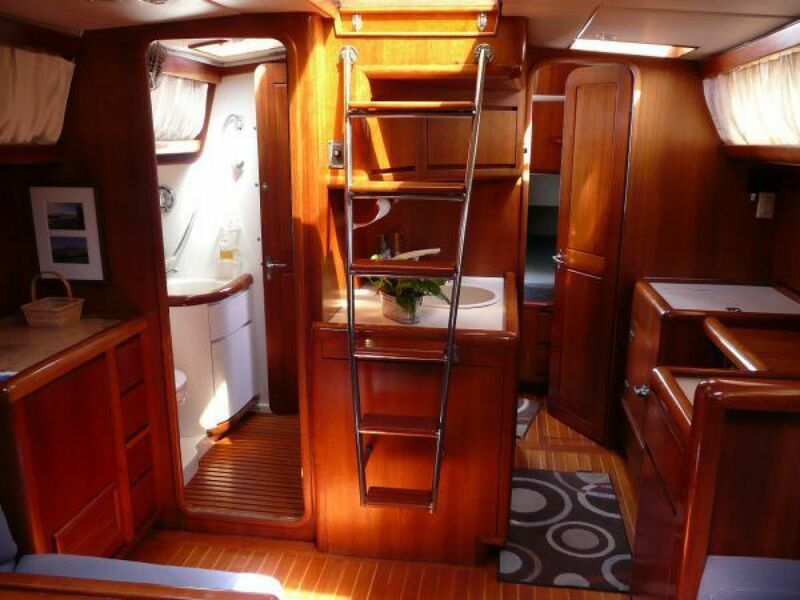 Hull construction takes advantage of modern laminating material, while assuring robust and durable construction. A light, strong sandwich of bi-directional fiberglass rovings and end-grain balsa core is well supported by section frames and bonded marine plywood bulkheads. The deck is of the same construction material with solid fiberglass in areas of extreme loads or compression: i.e. Genoa tracks, thru-hulls etc. Deck layout is set up for shorthanded sailing with all primary winches close to the helm and halyard and reefing lines led aft. Mainsheet traveler is on the coach roof clear of the cockpit. The port coach roof utility winch is electric for easy hoisting of the main as well an assist in trimming the main. #45 CQR w/chain and rope rode. Custom polished S.S. stemhead w/ anchor roller. Custom teak cockpit table w/cover. Molded in recessed swim platform. Custom bow, stern and midships S.S. chocks and cleats. Custom cockpit dodger w/S.S. grab rail. (1) Full batten racing Main.